Our discounted 3 Inch Dealer Puck Engraved Casino Quality puck is the same as used in almost all casinos. This durable puck is white with black engraved letters on one side and black with white engraved letters on the other side and protected with two o-ring bumper rubbers on the sides. It measures a full 3 inches in diameter and almost 3/4 inch thick. 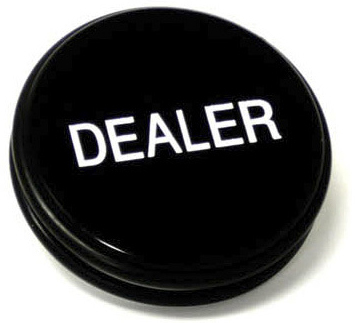 Dealer pucks are used to describe who is the dealer with the first card being dealt to the left of the dealer puck.